the living room and the kitchen have direct access to a covered terrace overlooking the pool. Upstairs you will find two more bedrooms and bathrooms. Downstairs again offers two more bedrooms, a bathroom and a lounge with access to the pool and bbq area. 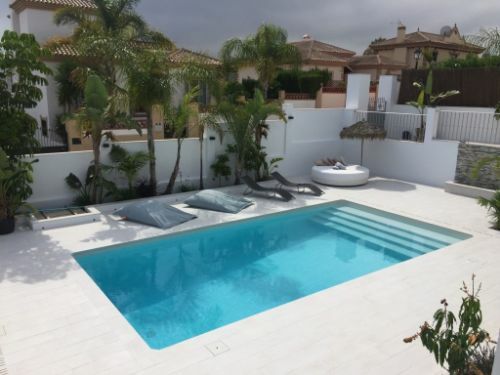 Outside you will find a recently renovated modern swimming pool, a lovely garden area and parking for 2 cars behind the gates. The town centers of both Alhaurin el Grande and Coin are just a 5 minute drive away. Marbella and the beach can be reached within 20 minutes – and Malaga International Airport is about a 30 minute drive away.